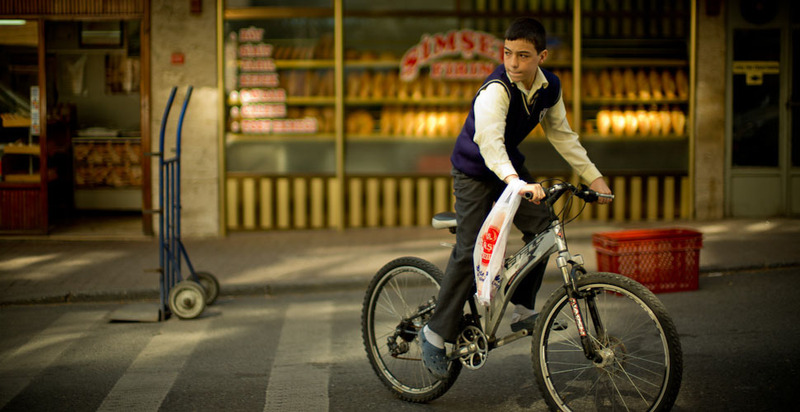 leica.overgaard.dk - Thorsten Overgaard's Leica Pages - The Story Behind That Picture 95 - "A moment in Istanbul"
The Story Behind That Picture: "A Moment in Istanbul"
The city of Istanbul is said to be "The city built on the seven hills". After a days walking in sunny weather with 24 °C (75 °F) I can assure there are more than seven hills in this city with beautiful light. Istanbul is the home for 14 million people and stretches over 120 kilometers from one end to the other. 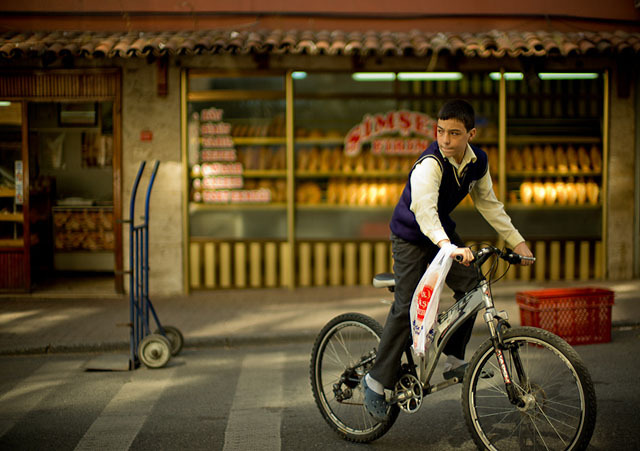 On our way up one of the steep roads I noticed a bakery with nice light and a boy parking his bicycle outside. I took it that he was the delivery boy and found it predictable that he would come out again, it was just a matter of how long I would have to wait. 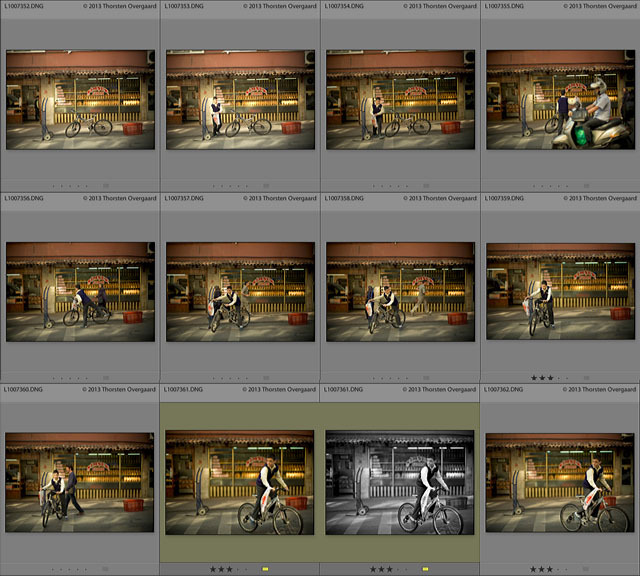 So I took position by a parked car and checked my focus on the bicycle and that the exposure was right. I didn't have to wait more than a few seconds. The photo I had planned would be him getting onto his bicycle again. But as I was well placed, I kept shooting a bit more, changing focus as he came closer. This way I also got him driving out and up the road. I selected three of the photos in the series of 11 photos that I took. And after having scrolled back and forth between them, I decided for the one where he is leaving. I'm glad that I stayed those few seconds longer. The one where he gets onto his bicycle would be a nice photo, but the one where he is closer to me is better. It is very common that when you "see a picture", what you see is also a stage for a picture to develop. Meaning that if you stay, something will happen there that will make that photo. That goes also for when you are not fast enough to get a photo. Just hang on for something similar to happen in that spot. The final photo in the final crop of the photo. "A Moment In Istanbul". Leica M 240 with Leica 50mm Noctilux-M ASPH f/0.95 at f/0.95 with 3-stop ND FIlter from B+W Filters. © 2013-2016 Thorsten Overgaard. The picture "A Moment in Istanbul" was selected to be on exhibition at Black Box Gallery in August 2016 in the exhibition "Color Burst: Contemporary Photography". 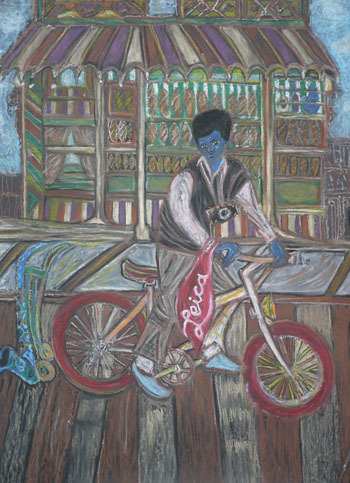 Renaldo Davidson from New York sent me this drawing inspired by my Istanbul photo of boy on bike. "Thank you for the shooting that picture. 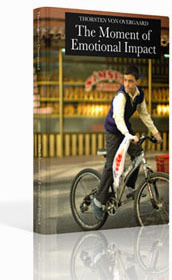 I am working on a collection of bike interpretations from images from around the world for a book." Photo above: A Moment In Istanbul. Leica M 240 with Leica 50mm Noctilux-M ASPH f/0.95 at f/0.95 with 3-stop ND FIlter from B+W Filters.